This backyard pavilion is an essay on the nature of privacy. Traditionally, city streets provide social space, and views from residences offer glimpses of public life. Often in suburbia, streets are relatively lifeless and views nonexistent, as houses turn inward to shelter the private domain. Front yards are merely ornamental, and back yards are fenced in. 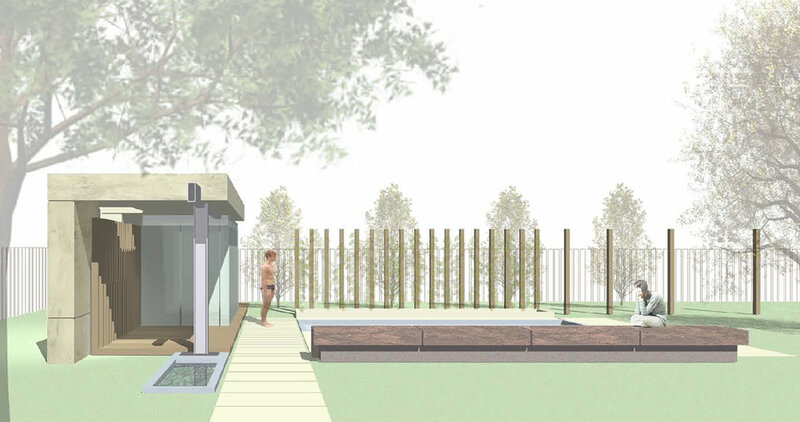 This project attempts to dramatize the insular character of the typical suburban backyard. Drawing from European and Asian scenographic landscape traditions, the pool house and its plaza are organized as a tableau to be viewed from the living room of the main house. From inside, the composition fills a picture window. 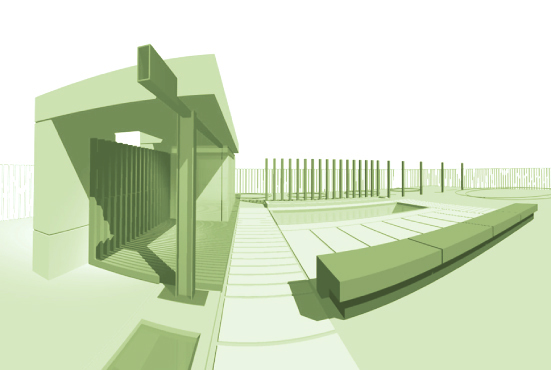 The pool itself cannot be seen, as it is hidden behind a low bench wall marking the edge of the plaza. Only light reflecting off the surface of the water might be evident on vine-covered wood posts, the backdrop of the setting. Concrete for the new structure is poured using aggregate salvaged from the foundations and walls of a demolished tool shed on site. A steel tube beam doubling as a drain spout empties rainwater into a stone-filled cistern in the foreground and animates the scene on rainy days, when the pool is not used.